Stock photo of a large stone Inukshuk against a deep blue sky atop Whistler Mountain, Whistler, British Columbia, Canada. This stock photo includes a large stone Inukshuk - Ilanaaq (the Vancouver 2010 Olympic Winter Games emblem) atop Whistler Mountain (2182 metres/7160 feet), Whistler, British Columbia, Canada. A deep blue clear sky makes this stone statue really stand out. 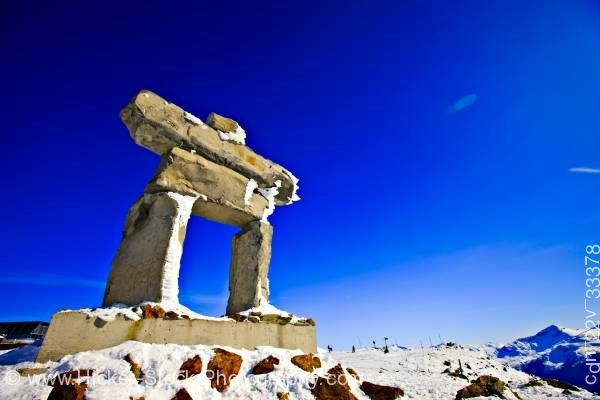 The Inukshuk which means "likeness of person" was first used by the Inuit People to mark trails, indicate caches of food, locate nearby settlements as well as good places to hunt or fish.